The Tarbabes take to the road to face San Diego Hoover in a second-round state playoff game tonight. Rendering courtesy of Mental Health America, Los Angeles. Offensive, tasteless, and uninformed, it cemented the belief within me that, while there are good folks out there, the view of the homeless was largely relegated to obscenity. The homeless are, despite one’s viewpoint on the subject, a relatively invisible host of bodies in Long Beach. They’re there, but most residents rarely acknowledge their presence except to trash them on NextDoor or blame their presence on politicians in comment threads. Like a trash can, most citizens relegate them automatically to the role of inanimate scenery—that is, until a 9-to-5 mental health facility that caters to them is suddenly being proposed some 1.5 miles from an affluent Long Beach neighborhood. Then, Long Beach residents speak up–and they spoke up raucously for over five years in the dreaded tale of Schroeder Hall. Sopo’s statement further elaborated potential home invasions, violence, and a plethora of other fear-mongering predictions such as drug addicts moving into Stearns Park—and from the NIMBY pulpit, he and others succeeded in shooting down the proposal to turn a part of Schroeder Hall in the 5th District in a Mental Health America (MHA) facility. Until 6th District Councilmember Dee Andrews stepped in. Schroeder Hall was an Army-owned property given to the City in 2006 as a “surplus property,” that is, federally owned land that is no longer needed by the federal government. Given its surplus designation, certain rules have to be followed via the McKinney Act signed by President Ronald Reagan in 1987–particularly Title V, which mandates that surplus federal properties must also provide a facility that caters to the homeless via a nonprofit in addition to its use by states and local governments. The City had originally hoped to turn the entirety of the facility into an East Division substation for the Long Beach Police Department to replace the overcrowded, 50-year-old station on Los Coyotes Diagonal. To follow the mandate, the City had proposed that the MHA open a day-hours mental health facility for the homeless across the street from Schroeder in an open one-acre lot. Andrews saw two things: an opportunity and jobs. He offered that, instead of building the federally-mandated homeless facility near Schroeder, they move it to his district in Central Long Beach. Specifically 1955 Long Beach Blvd., a building that was in dire need of some TLC while also being on a busy corridor. Four years later, the groundbreaking took place this past September 22 and with it, brought something mental health advocacy organizations just don’t really achieve often: a great building that isn’t just a facility. 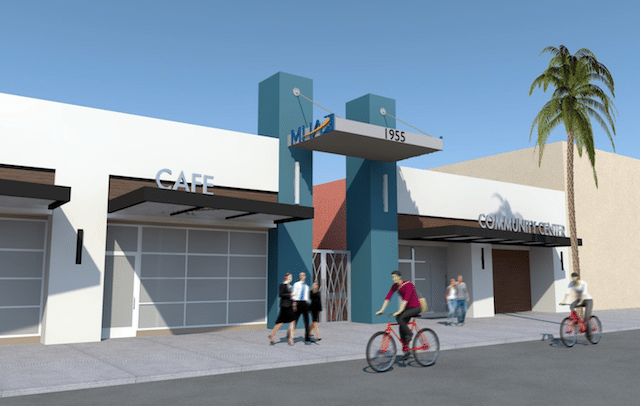 On top of providing mental health services, the site will provide direct job training to the homeless and jobs themselves at the Third Wave Coffee shop—backed by Lakers giant Metta World Peace—set to be built within the facility. In other words, co-existing with the neighborhood rather than stirring up fears, providing amenities to a business-starved stretch of Long Beach Blvd., providing a federally-qualified, five-room health clinic with free and low-cost services to neighborhood residents, and incorporating the homeless and mentally ill into social living. Mayor Robert Garcia called it a “new model for caring for people with mental illness”—and he’s absolutely right. This isn’t just a hit, but a home run for Long Beach. I couldn’t be more honored that this project became a reality. And to Mr. Sopo, as well as all the other xenophobic naysayers, I still wish it was your neighborhood receiving the facility because I think it is you who would have learned the most compassion and knowledge from it. Hopefully you’ll stop by when it opens next year.